Did India and China Escape the Black Death? One of the few things everyone studying the plague can, I think, agree on is the importance of plague dynamics in Asia. Genetic diversity and biogeography suggest that Yersinia pestis evolved in East Central Asia (S. Russia, Mongolia, N. China) and spread along the Eurasian steppe from the Caspian Sea in Kazakstan to the Mongolia very early, perhaps even before it became a human pathogen . The orange labeled clones in the diagram below represent Y. pestis clones that branched off of the main stem before Y. pestis was a human pathogen. These clones only infect voles . They are spread in a wide belt along the Asian steppe but as these are modern clones, we can’t be sure how early this spread occurred. Pandemic Yersinia pestis, ‘the plague’, could have emerged anywhere along this wide Asian belt. Note the red clones (the “Medievalis biovar”) shadow the Silk Road. The three main pandemics probably arose from different localities as clones were slowly spread along the Silk Road and endemic foci emerged and expanded [1,2]. The Plague of Justinian is first recorded in Pelusium Egypt, but it probably arrived via canals linking it to the Red Sea and ultimately the Indian Ocean. The Black Death is first recorded at Caffa on the Black Sea. The third (modern) pandemic began in southern China (purple clones on the figure). Not unsurprisingly it is difficult to trace these pandemics back to an endemic site since as a primarily rodent pathogen, Yersinia pestis can move without effecting humans. The Black Death (1347-1352) draws all the attention because of its scope and scale, the amount of evidence, and the intensity of its legend. In some parts of the world, legend is nearly all we have (or have so far). Although the scientific evidence points toward an Asian origin for Yersinia pestis, there is precious little documentary evidence of it in Asia before modern times (17th century onwards). George Sussman set out to examine the evidence of the Black Death in India and China in the current edition of the Bulletin of the History of Medicine. What he found in both enlightening and yet mystifying. Western legends of the Black Death in the Far East go back to contemporary 14th century accounts of the plague in Europe and the Middle East . Witnesses of the Black Death fueled by traveler’s stories imagined that all the known world was stricken, embellishing their writing accordingly. For the most part, modern historians have accepted their accounts of plague in China and India without scientific or historical evidence from China and India themselves. Sussman notes that McNeill’s influential Plagues and Peoples argues that plague foci in the Indian Himalayas and in central Africa are much earlier and more likely to be the source of the first plague pandemic (6th century) than the endemic strip along the Eurasian Steppe that McNeill dated to the 14th century . 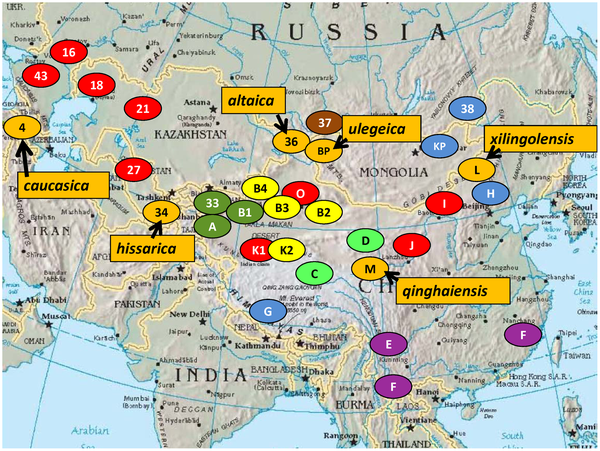 Modern genetic diversity and biogeography points toward just the opposite with the eastern Asian steppe (Mongolia/N. China) being the original focus and the African focus dating to about the 14th-15th century . There isn’t much evidence that the Indian Himalayan site is very old at all. We clearly need to learn a lot more about the Indian Ocean trade routes in Antique and Medieval periods to understand how the plague reached Pelusium in the 6th century and southern Africa by the 14th century. So what evidence is there for plague in India before the third pandemic? During the 14th century northern and central India was ruled by Islamic sultans based in Delhi who kept close ties with the Central Asian peoples they came from and with the Middle Eastern centers of Islam . They were well-connected diplomatically, economically and culturally with both Central Asia and the Middle East, areas that were both devastated by the Black Death and its successive waves. Yet there is no evidence of the plague in 14th century India . Origins aside, this is strange, for there to be no record of plague even at ports makes me suspicious of the completeness of the written records. I would expect small local epidemics in ports, even if it couldn’t get traction in the countryside. Sussman argues that the Indian subcontinent may have been the only area of Eurasia to have population growth during the 14th century . Plague is unambiguously described in the Deccan of India in the early 17th century. It first came to the attention of Emperor Jahangir in Hindustan in 1616 . The annals of the Emperor Jahangir record the third year of the winter plague with mad and dying rodents in January 1619 . The annals include an interesting story of a cat contracting the plague from a mouse and passing it on to a girl who triggered a larger outbreak. He is describing a case of secondary pneumonic plague that then spread throughout the household. The development of secondary pneumonic plague in a child can be especially damaging because more people will come to care for a child than an adult. In this case, mouse to cat to child to family doesn’t require any fleas at all. The cat got the plague from biting the sick mouse, the child got the plague from playing with the cat and passed it on to her family. The lack of buboes in the last people to die suggest that at some point in the transmission bubonic plague became pneumonic, probably in the child. So plague is firmly established in 17th century India, but not in the 14th century during the Black Death pandemic. While I expect that we may yet find evidence of small outbreaks, there not does appear to have been a large epidemic. Why that was is unknown. Perhaps a combination of geographic isolation, climate, vector availability and sheer luck. Turning to neighboring China, the picture becomes more complicated. As I’ve already mentioned, Yersinia pestis genetic diversity and biogeography suggests that it has been in northern China long before any of the pandemics. With the wide-spread of early clones, the pandemic does not necessarily have to begin where there is the greatest genetic diversity. Sussman notes that in the third pandemic the large northern outbreak was marmot-derived pneumonic plague while the southern outbreak was rat-derived bubonic plague . This is still the case today. A marmot derived outbreak of pneumonic plague occurred in northern China as recently as 2009. If plague in northern China is usually pneumonic plague from marmots, I’m not surprised that they did not have a specific name for the disease. Pneumonic plague does not produce unique enough symptoms to differentiate from other rapidly lethal respiratory diseases. The Yuan dynasty controlled China and Mongolia during the first half of the 14th century. This period coincided with a concerted withdrawal from the greater Mongolian world most of whom had by this time converted to Islam . It was a time of great turbulence: famines, epidemics, natural disasters, political unrest, as the last remnants of the Mongol empire in China devolved to regional warlords and the Ming Dynasty began to develop . Record keeping during this devolution is sporadic and uneven, but it does show three rounds of massive epidemic in 1330- 1350 each taking over 60% of at least regional populations. Unfortunately medical descriptions of the disease(s) have not survived . Sussman’s analysis of the overall Chinese population during the early to mid 14th century is that the losses are comparable to the 25-30% loss in Europe that is directly credited to the Black Death . Given the ancient foci of plague in northern China, this is where we should expect it to come from in the 14th century, and so it does appear to. On the other hand, Sussman notes that the first obvious medical description of plague in China dates to 1644. Sussman questions whether the 14th century epidemics were plague based on some questionable criteria. He is bothered by the apparent lack of spread of the epidemic to the southwest (where the third pandemic began). He thinks a ‘virgin territory’ epidemic in densely populated China should have easily spread throughout China as it spread throughout Europe. The European pandemic was the unusual behavior for the plague, not a regional epidemic in China where plague was more ancient than in Europe. In other words, I don’t think that Europe and China were equally ‘virgin territory’ epidemics. The importance of ‘virgin territory’ is probably also being over estimated for Yersinia pestis. Also the terrain in southwestern China is unlike northern China or Europe; it is more tropical. We need to let go of the idea that the second and third pandemic must behave the same. With a sample set of only three pandemics, we surely can not say that there must be one pattern that they will all conform. The lack of medical description also makes Sussman question if it was the plague. However, there is apparently no medical description at all to rule plague out or in. He also finds it unlikely that the plague could have traveled the length of the Eurasian steppe because much of it is so sparsely populated. Yet the first epidemic in northern China occurs in the early 1330s, surely enough time to travel the Silk Road west by caravan or Mongol horsemen. It is also possible that this clone spread along the steppe over several decades or even a century before it erupted at multiple points into large epidemics where the conditions were right and into a pandemic in the west. Noticeably absent in this discussion is archeological evidence in either India or China. Now that we can identify Yersinia pestis aDNA in remains, hopefully this could be investigated in at least northern China. Unfortunately, I rarely hear about any medieval archaeology from India or China. Plague’s normal biome is semi-arid grassland, shown on this simplified biome map as brown and yellow. From Sussman’s information it appears that the Black Death avoided tropical rainforest biomes (light green). This is not really surprising given its endemic regions. It is the opposite of the third and weakest pandemic. The endemic foci produced by the third pandemic are the usual semi-arid grasslands in the American south-west, Madagascar (which has some savanna), and Brazil. So in conclusion, what are we left with? First, western reports of plague in the east may be more rhetoric than reality. Even if there were small unrecorded outbreaks in India, there doesn’t seem to be much evidence of population decline. For China, it would help to have more evidence of the nature of the northern epidemic. However, the coincidence and lethality of the epidemic support it being the plague. There is still a lot of work to be done on plague history in southern Asia.